At least eight out of ten Nigerian women wear wigs as part of their fashion items for their day-to-day activities, a survey by the News Agency of Nigeria (NAN) reveals. The study, conducted on 1,100 urban and sub-urban women from Abuja, Lagos, and Port Harcourt showed that 81.8 percent of respondents own wigs and prefer them to sew-in weaves. While a sew-in is a weave sown onto the wearer's hair, a wig is a head covering made from human hair, animal hair, or synthetic fiber. 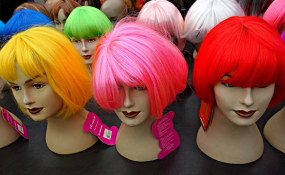 The survey also showed that 54.5 percent of them own between one to three wigs and the remaining 45.5 percent owned up to six or more wigs for rotation purposes. Explaining their preferences, the women told NAN that convenience, ease of use and cost-effectiveness were the major reasons they preferred wigs to sew-in weaves. Bolaji Osofisan said, "It's super comfy because I can take it in and out at ease. It is durable because I can reuse over and over after a wash. It is trendy, doesn't smell and my hair gets to breathe daily." Similarly, Akpezi Ikede stated it was easy to take out and style by oneself thereby reducing frequent salon visits and saving cost. Some others added that they were afraid of the wig falling off and that the cost of wigs keeps rising every day, making it difficult to keep up with. NAN gathered that prices of wigs start from N15,000 to as high as N500,000 depending on the quality of human hair used and the illusion of the lace front. Commenting on the wig trend, celebrity hairstylist, Ada Kanu of Dugykay hair, said, "Wigs are trending now because of the weather and the fact that it is an alternative to sew-ins. "They are time-saving, very convenient to wear and can change one's look in seconds. I would advise clients to go for convenience - either sew-ins or wigs.